I just got a notification about our Sicily plane check-in – wow, is it already June? The first half of the year passed so quickly and although I try to fill my days with meaningful actions and live mindfully, it still feels like time is going by so fast. Cooking seasonally is one of the ways to live the moment and it’s one of my favorite practices. 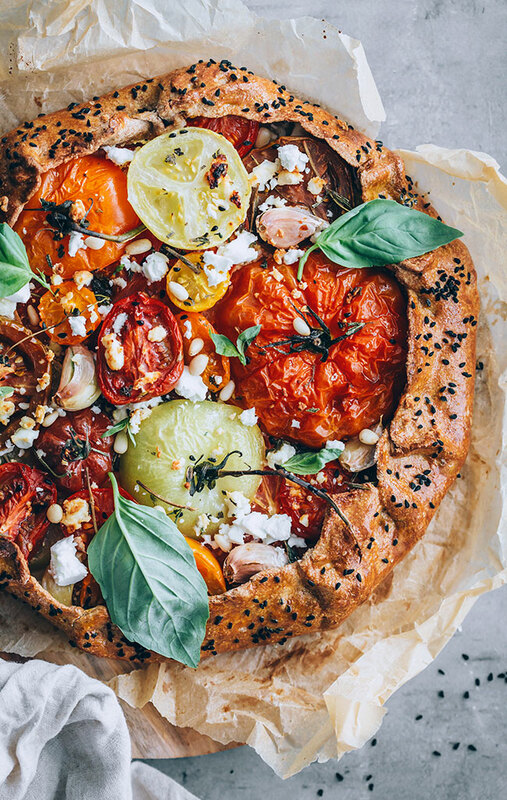 It already is the tomato season and since I switched my cooking to the Mediterranean mode, I decided to make this basil flavored tomato pie with honey and feta cheese. It was simply delicious! The only thing that I would improve is be to cook and serve it outdoors next to our beloved Mediterranean Sea (what a dream!). Otherwise, the combination was really a hit. 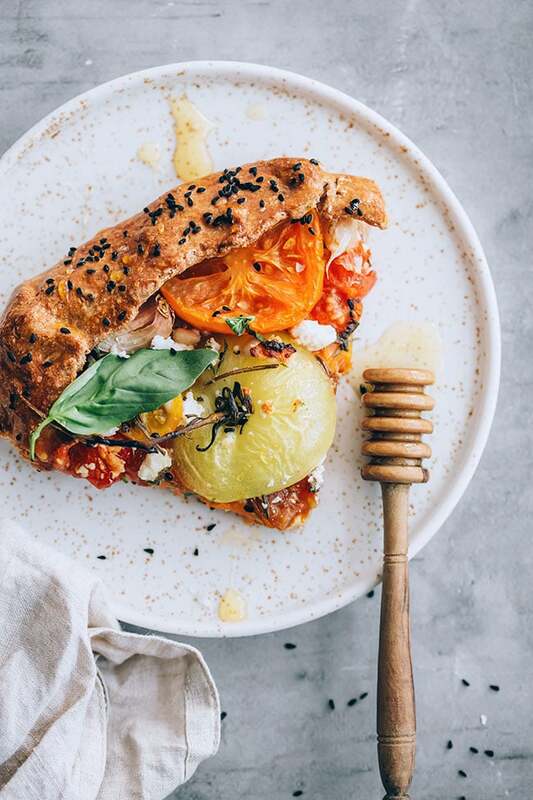 Honey and vinegar perfectly balance the tomato taste, while all the other details – aromatic herbs, toasted pine nuts, roasted garlic and the creamy feta cheese make this dish truly taste like holidays. 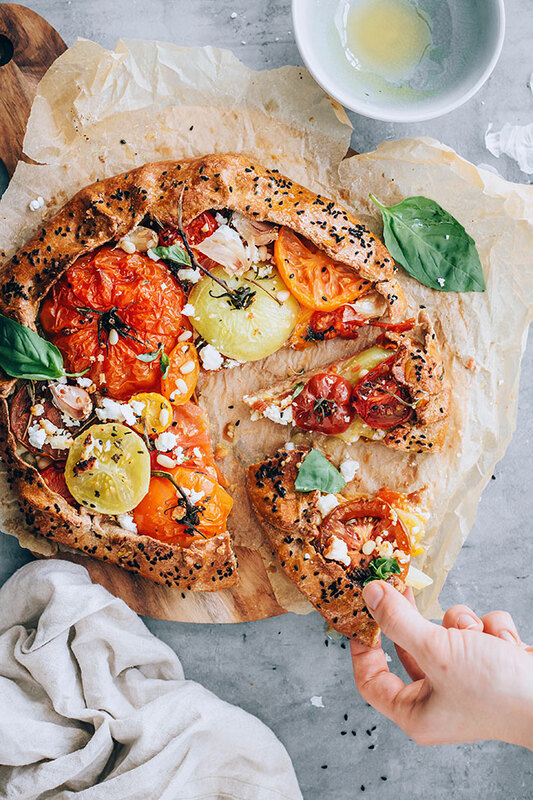 There’s so much more to explore about tomatoes beyond a simple salad. While most of the vegetables loose a lot of their nutrients when cooked, things are totally different with tomatoes. 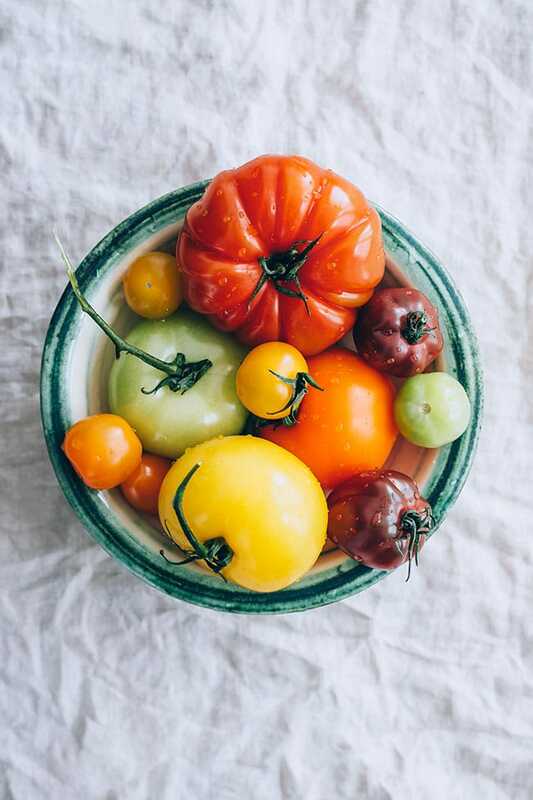 Their carotenoids lutein, lycopene and beta-carotene actually turn more stable when tomatoes are boiled or roasted, especially if their peel is kept untouched. Lycopene especially has exceptional effects on lowering the lipid oxidation in our blood stream, reducing the risk of chronic disease and early ageing. And just like the other carotenoids, the ones in tomatoes are better absorbed in our bloodstream if served with a healthy oil source. This is why I always use a good quality extra virgin olive oil for my salads or cooked vegetables, and add avocado to almost everything! Although the classic galette or pie crust requests butter, I wanted to keep mine light and decided to completely change the classic recipe by adding extra virgin olive oil and a little yeast, to avoid getting too much crunch and actually keeping it soft and airy. If you want to experiment with tomatoes, make sure you also check my Roasted Tomato Soup, Mediterranean Quinoa Salad with Roasted Veggies or Lentil Pasta with Marinara Sauce. 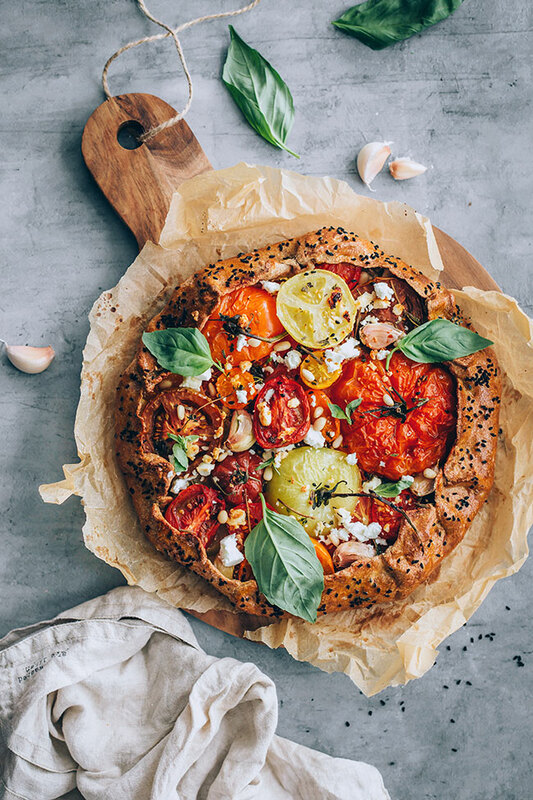 Brightly coloured tomatoes, creamy feta cheese, aromatic herbs and honey - all the good summer things brought together to create the perfect summer pie! Preheat the oven to 175 C/346 F.
In a large bowl mix the flour with yeast, salt and sugar, then add the water and olive oil and mix to obtain a dough. Knead the dough for 2-3 minutes, then roll it into a 14 inch diameter thin round. Spread the mustard onto the dough round then add half of the crumbled feta, 2 garlic cloves, a few basil leaves. Top with tomato slices leaving about 1.5 inch border around the edge. Play with sizes and colour to obtain a nice pattern. Add the rest of the garlic cloves, feta and basil, drizzle with apple cider vinegar and olive oil. Fold the empty edge of the dough over the filling to obtain a round pie. Brush the dough edge with egg yolk and sprinkle the Nigella seeds. Bake for 40 minutes, then remove, and set aside for 10 minutes before serving (when you take the pie out of the oven, it will be filled with tomato juices, but they will be absorbed into the dough). Drizzle with honey, top with toasted pine nuts, garnish with fresh basil and serve warm or cold. Can’t wait to try this recipe. It looks fabulous. One question. What are nigella seeds? Never heard of them. If I may jump in and answer that, Nigella are also sometimes called black cumin. They are the seeds from Love-in-a-Mist flower! This looks delicious! Always looking for new ideas for my home grown tomatoes! 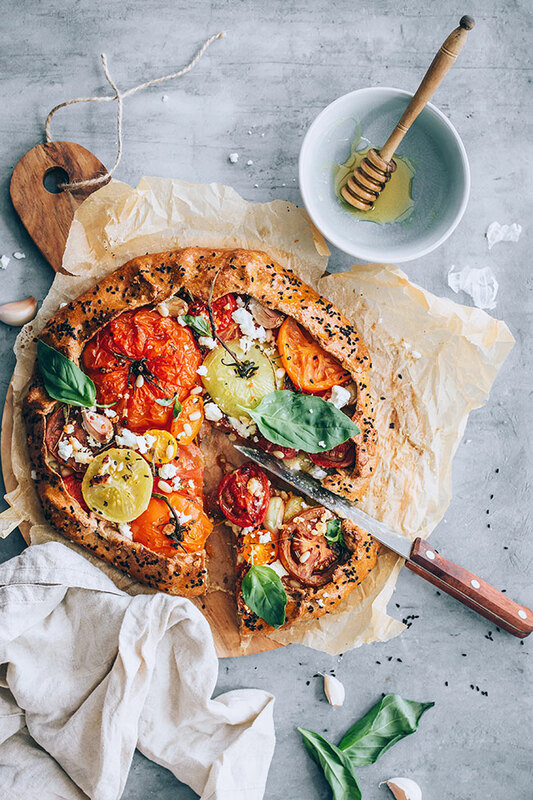 Free form pies always look awesome – for everyone else – lol! Mine never look like this – but this does inspire me to try again! So colorful too! Hi! I tried this recipe last night and never made it past the dough. I followed the instructions exactly and my dough was a wet, sticky mess…should I have let it rise? Or does it require more flour than just a cup? It was very frustrating and disappointing so I’d love some tips because the pie just looks so beautiful and delicious, I don’t want to give up! Hi Kelly, my mistake, the recipe calls for 2 cups flour for the listed water amount. It doesn’t need kneading, because it shouldn’t turn very puffy, but more like a thin pizza crust. If it doesn’t get together nicely, just add a bit more flour, but I’m sure it will turn out good this time! Sorry for the trouble, I use the gram unit for measuring ingredient amounts, and sometimes I miscalculate when turning to cups. Let me know how it turns out! My pie is in the oven right now! Can’t wait to see how it turns out. I used a premade pie crust, though, because I’m lazy and had one around. Hopefully that doesn’t mess things up too much! 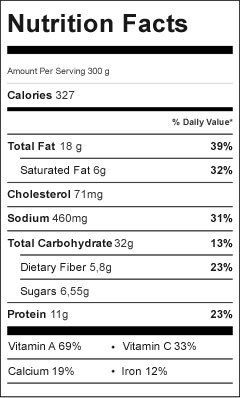 One question though, I see that there’s dried oregano listed in the ingredients, but never mentioned in the recipe! At what point was I supposed to add that in? I sprinkled it over bottom layer of the pie, before adding in my tomatoes. We’ll see how it turns out! Wow, that’s great, I’m happy you decided to give this a try! The oregano can be added at the beginning or simply sprinkled after removing the pie out of the oven. I made this recipe tonight for my family! I doubled the crust to make 2 pies! I loved the crust ingredients and tweaked the toppings a little. It was fun to make the pizza look aesthetically pleasing. I’ll be making the crust again for pizza nights!